“We can forecast how active the spring tornado season will be based on the state of El Niño or La Niña in December or even earlier,” said lead author John Allen, a postdoctoral research scientist at the International Research Institute for Climate and Society (IRI), part of Columbia University’s Earth Institute. While the information can’t pinpoint when and where storms will wreak havoc, it will nevertheless be useful for governments and insurance companies to prepare for the coming season, Allen said. 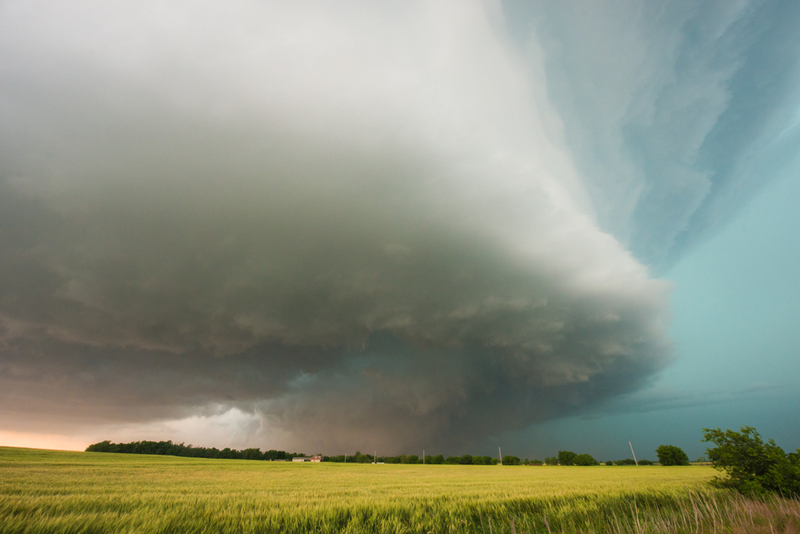 In recent weeks, researchers from IRI and other institutions have detected El Niño conditions over the Pacific, which implies that this spring will be a relatively quiet one for severe storms in the southern United States. Below: Climate scientist John Allen gives a forecast for the spring 2015 tornado and hail season in the southern U.S.
“The big contribution of the paper is that it looks at the changes in environmental conditions associated with ENSO,” said Harold Brooks, a senior research scientist at the U.S. National Oceanic and Atmospheric Administration (NOAA), who was not one of the study’s authors. “Previous efforts have focused on tornado reports, but the connection with changes in large-scale conditions hadn’t been made,” he said. Last year, 47 people died in tornadoes. But in 2011–a La Niña year– tornadoes killed more than 550 people, higher than in the previous 10 years combined. Hail storms and tornadoes cause an average estimated $1.6 billion in insured losses each year in the United States, according to the insurer Munich RE. Powerful, isolated events such as the 2011 Joplin, Missouri, tornado can smash the average. That storm alone caused several billion dollars in damage and killed 158 people. The idea that ENSO can affect the frequency and locations of tornadoes and other severe storm systems isn’t new. It is already known to exert a strong influence on temperatures and rainfall in the United States, and affect the position of the jet stream. Yet scientists have had difficulty quantifying ENSO’s role in tornadoes, for two reasons. First, a variety of other factors can make them seemingly random: one year can see hundreds of twisters, while another sees few. Also, historical weather records are not reliable for long enough to make strong statistical connections. This is true especially for tornadoes, which often flare up and die quickly. Past studies that have relied on eyewitness records alone have had limited success, said Allen. “For example, previous work has shown a clear linkage between ENSO and winter activity, but spring—the season when most of tornadoes occur in the southern U.S.—remained an enigma until now,” Allen said. When ENSO is in a warm, or El Niño, phase (top), the frequency of tornadoes goes down. When it is in a cool, or La Niña phase (bottom), tornadoes increase (indicated by red areas). The effect is strongest in the boxed area. From Allen et al., Nature Geoscience, 2015. Adding a forecasting component was relatively straightforward. “We’re already set up to monitor and forecast ENSO,” said Tippett. 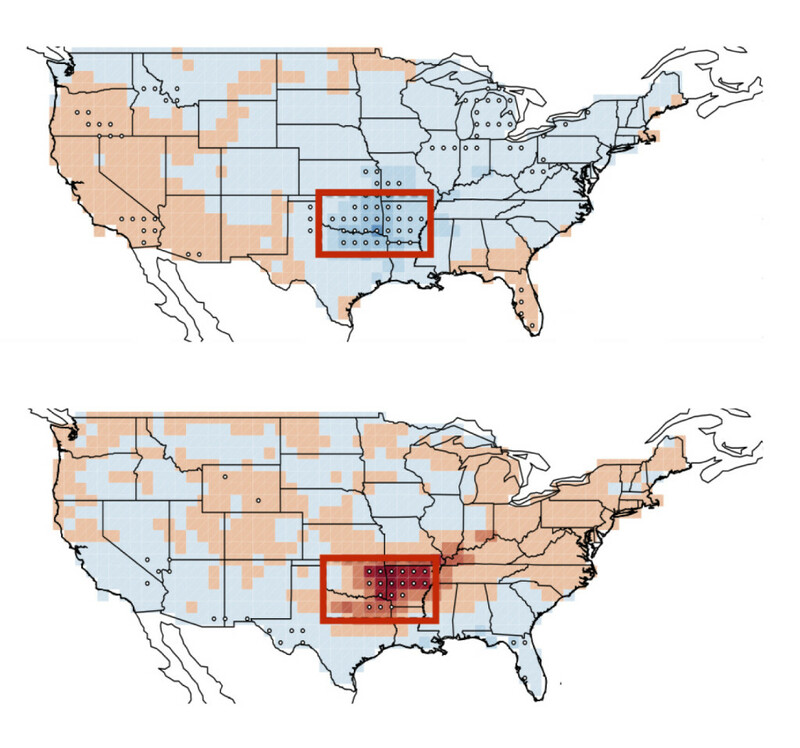 “We know that ENSO affects the large-scale environment, and the large-scale environment affects the tornado occurrence.” During La Niña, both vertical wind shear and surface warmth and moisture increase significantly in the southern states, making conditions favorable to severe storm occurrence. Agencies such as NOAA and its counterparts all over the world constantly monitor conditions in the Pacific to spot a developing El Niño or La Niña, so the authors say it wouldn’t be too difficult to issue a warning for tornadoes or hail based on the ENSO state. They note caveats, however. First, ENSO is not the only driver of severe storms. “Any kind of extreme weather is at most only loosely controlled by coherent, predictable climate phenomena like ENSO, and tornadoes are no exception,” said coauthor Adam Sobel, who also is at Columbia’s engineering school, as well as its Lamont-Doherty Earth Observatory. Second, the current study shows robust correlation only in the southern states, where the ENSO signal is especially clear. “A lot of the year-to-year variability is for all practical purposes random and unpredictable,” said Sobel, who also directs a new Columbia University Initiative on Extreme Weather and Climate.